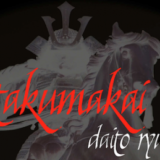 One of the things that is very interesting about the Takumakai`s Daito-ryu is that it has captured the essence of the teachings of two of Japan`s greatest post Meiji era martial artists. 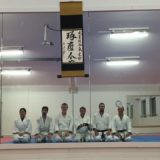 Within this school can be found the flowing movements made famous by Ueshiba sensei’s Aikido and also the direct and ruthlessly efficient approach and kensetsu waza (joint locks) of Takeda sensei`s Daito-ryu. The Takumakai way of Daito-ryu is thanks to the work of Hisa Takuma sensei and Nakatsu Heizaburo sensei. 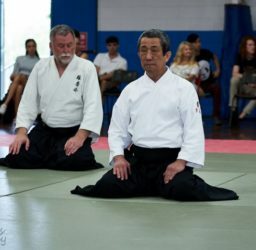 They each in their own way preserved and passed on the teachings of Takeda sensei as the middle founder of Daito-ryu and his student Ueshiba sensei. Ueshiba sensei was one of Takeda sensei`s greatest students and a great martial artist in his own right having studied the martial arts of kenjutsu, jujutsu, jojutsu and spear forms (yari). Ueshiba sensei eventually transformed the art of Daito-ryu into his own approach to modern budo focusing on universal harmony. He called this new art Aikido. 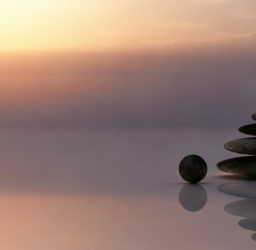 One of the great aspects of this art was that he intended for people to use Aikido practice to develop themselves as more connected and balanced human beings. Ueshiba was strongly influenced by the Omoto religious sect and it`s charismatic leader (Deguchi) who was to provide him with some of the spiritual and philosophical motivation behind the development of Aikido. 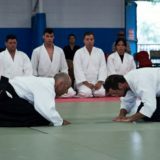 After the end of World War II during his time in Iwama, Ueshiba sensei took out many of the more dangerous of the Daito-ryu techniques and modified or invented other techniques to fulfill the goal of taking due care of the attacker(s) as well as the defender. 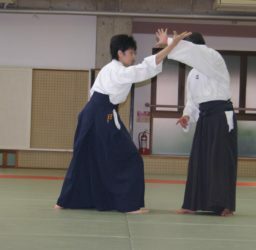 This approach was to become the basis of many of the modern forms of Aikido. Takeda sensei did not have the same ethos as Ueshiba sensei, Takeda came from a different era and followed the warrior code of the bushi (the Japanese Warrior cast). The style of martial art he taught was mainly of the school of the life giving sword, an approach which was in its essence defensive rather than offensive but still very capable of lethal response. 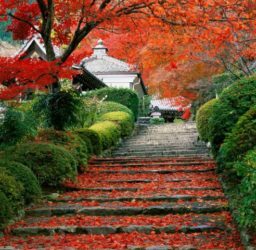 Takeda was a man shaped by his time, as he grew up during the tumultuous dying moments of Japan`s feudal past. In his life he would have known great pain, hardship and loss. 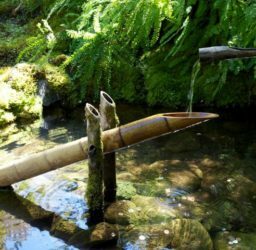 The history of the end of the Aizu clan is a very sad and powerful story. The movie the last Samurai was based on this period of Japanese history. In his youth Takeda sensei was taught by some of Japan`s greatest swordsmen of that period as well as learning many things from his family including the Oshikiuchi , Daito-ryu and sumo (which was something he greatly enjoyed). Takeda spent his youth studying the sword and other weapons with as many masters as he could visit, his main kenjutsu style was Ono ha Itto-ryu which was one of the styles within the Aizu clan and the Takeda family. Whilst very small in stature he was a very strong individual both physically and mentally. 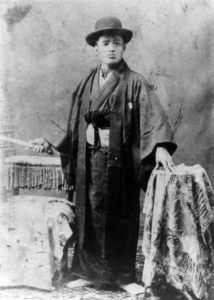 Whilst his home was in Hokkaido (the northern most island of Japan), he spent much of his later life traveling around Japan teaching his martial art to police and high ranking military officers. 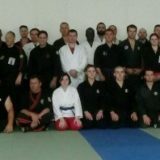 His normal format of teaching was the 10 day seminar. 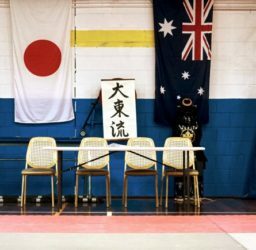 He spent three years teaching Hisa Takuma and others at the Asahi Dojo in Osaka, this was one of the longest periods he would spend in one place teaching. 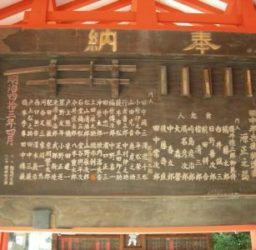 Hisa Takuma sensei famously received one of the few certificates of complete transmission from Takeda (Menkyo Kaiden ) and also an 8th dan from Ueshiba. Hisa sensei was a Sumo champion when he was at university and because of this he was given the task of protecting his place of work (the Asahi Newspaper) from the violence of some extremists that were harassing the paper at the time. In 1934 Hisa was introduced to Ueshiba sensei as someone who could teach Jujutsu to him and the staff of the newspaper and so became his student studying jujutsu with him for three years. Hisa always remembered Ueshiba sensei very fondly as a kindly and friendly teacher. After three years of practice with Ueshiba sensei, Takeda sensei visited the Asahi Dojo in 1936 and took over teaching Hisa and the other staff. Unfortunately at this time there had been a disagreement between Ueshiba and Takeda, possibly over money but perhaps there was more to it. In any case, Ueshiba left the Asahi Dojo without comment and never returned. 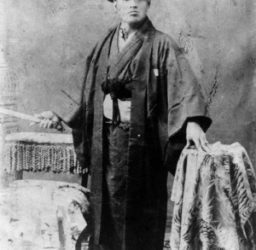 Takeda would stay on for three years and issued certificates and teaching licenses for Daito-ryu to several of the staff. Many years later after the death of Takeda sensei, Hisa Takuma would reconnect with his old teacher Ueshiba sensei whom he remembered very fondly. It was during this reconnection with Ueshiba sensei that Hisa was awarded an 8th dan (1968?) in the art of Aikido. It was around the teachings of Hisa Takuma sensei that the Takumakai was formed. Hisa sensei faithfully recorded many of the techniques that he was taught in photographs taken during the period he was being taught by Takeda sensei and Ueshiba sensei. 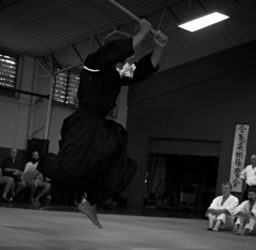 The essence of the teachings within the Takumakai is not in the photographs but the living system of mind and body coordinated movement that unites all the techniques making this an effective and complete martial art. The following is an excerpt from Aikido Journal 1995 Issue 103# Interview by Stanley Pranin of Aikido Journal and Takumakai`s General Director Hakaru Mori (see Aikido Journal Interview with Hakaru Mori for the complete article). Watching Takumakai techniques I get the impression that they`re like a mixture of the precise joint techniques of Daito-ryu and the flowing techniques referred to in Aikido as ki no nagare . Hisa sensei learned from both Takeda and Ueshiba sensei so that`s probably true. 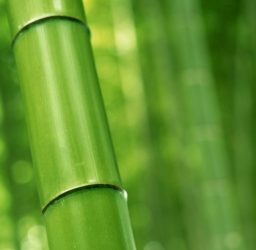 There are so many techniques that right now we`re just trying to keep up with mastering kata, but if we sat down and thought about it for a moment we`d find that ki no nagare plays an essentially important part in a great many of both our aiki and our joint techniques. That`s one of the reasons we`re having Tsugutaka Chiba conduct numerous workshops on the techniques he learned from Kyoju Dairi Heizaburo Nakatsu. 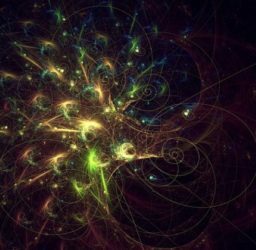 In addition, once a month I hold small research seminars on the Soden techniques. The purpose of these is not for me to teach, but rather to have people help me remember things about them. Just four or five of us get together to go through the techniques in the order they appear in the Soden photographs. It would be tiresome to go through all 11 volumes from beginning to end, so instead we`ve started with number one in volume one and number one in volume three at the same time. When we are finished we will go on to volumes two and four. 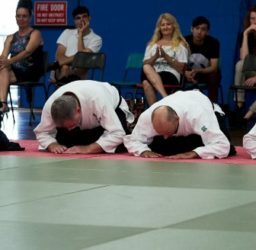 That way we avoid doing only sitting ( idori ) techniques or only standing techniques ( tachiai ). 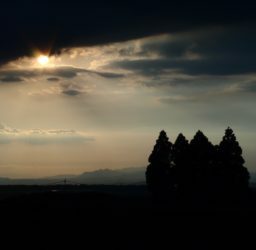 We`ve started taking photographs whenever I remember some important point that needs to be recorded. 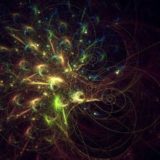 Also there are a number of techniques that don`t appear in the Soden but need to be understood – things such as fure (touch) aiki, nuki (drawing out) aiki, tome (stopping) and aiki aiki techniques that rely solely on moving the opponents centre of gravity, and the two-sword techniques. 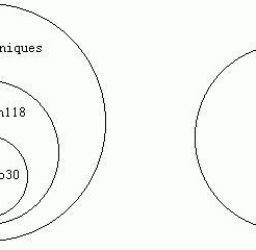 I`m having everyone study these things during our research seminars.